I use my Meade LS 6 ACF mainly for visual observations. 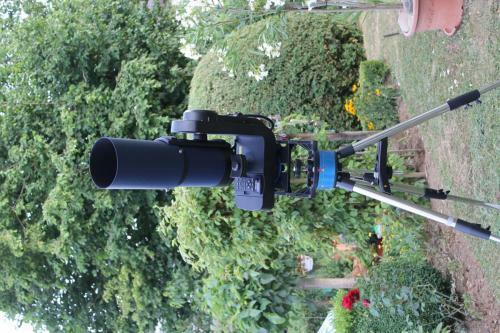 I wonder if the Meade f/6.3 Focal Reducer/Field Flattener can be used with this ACF telescope and - if yes - how could my visual observations be improved. What will be the focal lenght for this 1524 mm scope after adding the Focal Reducer ? I know the visual field will be enlarged but will the brightness of the DSO be improved as I have heard ? Is there a vignetting efect which can be visually detected ? Thank you in advance for your reactions. I am going to piggy back Florin's question and ask how the same focal reducer may help with an LX90 ACF with a Meade 2" Enhanced Diagonal. The two scopes are both f/10. The f/6.3 focal reducer reduces the effective focal length to an equivalent of an f/6.3 scope. Take the focal length of your f/10 scope and multiply it by 0.63 and you get the focal length of your scope with the focal reducer on it. The present f/6.3 reducer is made with coma correction in it for the original SCT optics. The ACF version has correction built into the lenses as it is. However, the difference in the outer edges with the f/6.3 reducer was not significant enough, I suspect, to warrant the production of a different focal reducer. Exactly how much coma you would see in the outer parts of an image taken would depend a lot on the field or size of the imager. You would simply have to try it and see what you think. I have used an f/6.3 focal reducer quite a bit on my LS8. I saw no significant coma in the outer edges, even with the 82 degree 24 and 30 mm eyepieces. I even used an extension tube between my two inch diagonal and the 30 mm eyepiece, which made the pupil size so big that it would not quite fit in my eye. The extension piece increased the reduction to somewhere around f/5. At that point, I was seeing more coma, but it still was not bad for my visual observing. The only time I saw any dimming of the image was when the image was too big to fit through my eye pupil. Eventually, with more and more reduction, there would have to be vignetting and distortion. I did not experience anything bad from my perspectives. Other people might think it was too much. Thank you for your response, so if I wanted to give the reducer a try, where should I install it? On the back of the OTA and in front of the diagonal? Yes, that is where you want it. Thank you again Bill for all your help. Meade needs to put you on their payroll. Would be a good investment for them. I use a Antares f / 6.3 SCT Reducer / Corrector and am very happy in the visual field and also in the photographic field. Because the ACF doesn't need Coma correction and because the Meade 6.3X reducer includes coma correction for other scopes, thereby introducing Coma if used with an ACF, I use an Optec Lepus 6.3x reducer, which is a simple reducer with no coma correction. Works great on my LX200ACF. I want to thank you all for your responses and for sharing with me your own experiences with field flatteners. The Meade and Antares field flatteners test sent by Wolfgang is truly impressive. 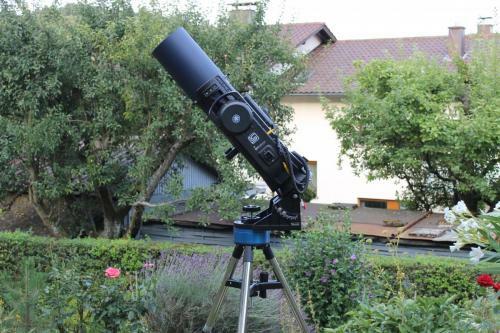 I will decide soon which field flattener to buy in order to enjoy an "enlarged" visual experience with my LS6 (I remember Wolfgang owns himself this telescope - greetings from me too, Wolfgang !). I wasn't aware about the Optec Lepus SCT reducer. I will look closer to this one before making my choice. But I wonder - reading Bill's and Stan's messages - why is Meade selling a field flattener which is made for the traditional SCT design (which Meade no longer produces as far as I know) and, therefore, introduces coma when used with his own ACF telescopes ? 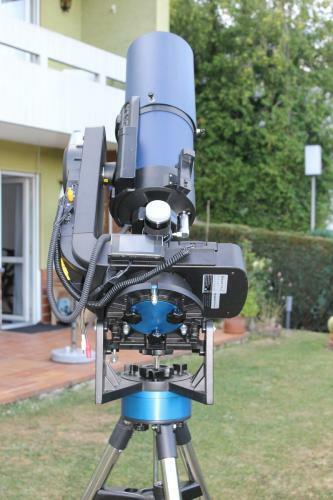 When will a Meade ACF dedicated field flattener be available ? If I said anything about why Meade produces the traditional focal reducer and if/when they are going to change, it would simply be speculation on my part. Personally, I have found the amount of coma around the edge of the field to be negligible and that may be why Meade has not started manufacturing a focal reducer without the correction in it. That is, however, just a guess on my part. When I looked around for a coma free reducer to go with my coma free scope, they were priced at that time around $400, which I was not willing to pay. They were all four element units and not the simpler version that one would think could be made. It does make sense that the next time a manufacturing run is made on something like that, if Meade only makes coma free SCTs, then they would make a coma free reducer. However, I may not know of some complication that makes a coma free reducer more expensive or more trouble to produce. I know (from German Astro forums) that the Focalreducer now produced by Meade on the ACF optics are matched. Unfortunately I do not know from what period. But I have decided for the Antares. Am satisfied. wanted the picture Send by LS6 in equatorial mode, do not go! Here the current status of LS6 in equatorial mode. Still working on the improvement of the wedge. Become Report me again. I have the Antares 6.3 and it is great from f/6.3 to even f/4 (2 diag star + APN canon eos) both in visual and photographic ! Hi Wolfgang - nice photos! I notice you are fitting an Eq mount for better tracking. I am thinking of buying an LS6 or LS8 and have read the using stacking software (like Astrostacks) allows multiple images to be stacked and compensated for AltAz errors. Do you have experience of this technique. To me the advantage of the LS series is the NON requirement for polar alignment etc. Also, a second question, with the Ae mount will the LS6 autotrack just as it does with the AltAz mount, do you need to set anything in the LS settings? have read their message later. After I have my LS 6 converted to Eq mount I am very satisfied with the tracking. I have to pay my LS6 now about Polaris (from my location visible). But go relatively quickly and with the polar finder used, it is also easy. You may also (as I do), use the 6.3 after the star diag. 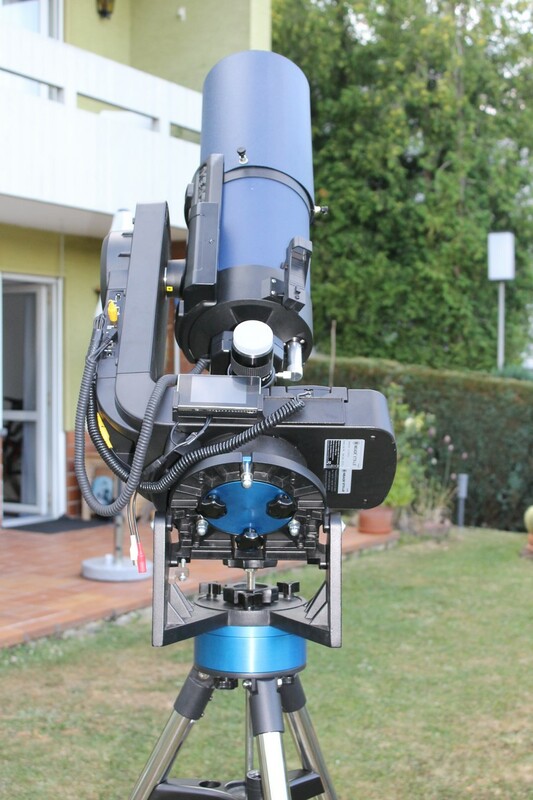 The most important things is to have 85mm (for the antares and celestron reducer) between the last lens of the reducer and the focal plane (increasing or decreasing this distance, change the reducer ratio and introduce coma or aberrations).